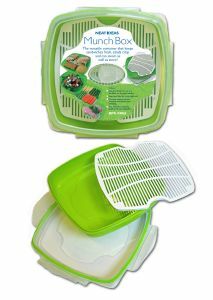 Neat Ideas "Munch Box" for reheating lunches and snacks. Neat Ideas Munch Box: reheat snacks and lunches in your microwave oven. Neat, compact and portable. the Neat ideas Munch Box is ideal for use in the microwave when cooking dinner at home and light enough to take to work to prepare a healthy lunchtime snack or meal. Neat Ideas Munch Box features a pressure relief valve for steaming and splatter free reheating, easy lift handles for safely picking up hot food, a tray insert for steaming fish and chicken - or vegetables - with a little water added. In addition this handy little steamer can be used to store food in the fridge and freezer and dishwasher safe making it easy to clean, easy to store and convenient to use. Suitable for preparing meals for 1 or 2 people.